In the middle of the night when you’re fast asleep, they come, they eat, they hide. How do you know? Well, you might not! Bedbugs are nocturnal pests and can feast on your blood without waking you up. How do you know if you have been bitten by a bed bug? There are a few key symptoms such as itchiness, little red bumps or welts and perhaps some swelling. It takes anywhere from hours to days for the symptoms to show. With their elongated beaks they inject a bit of their saliva which contains an anesthetic substance, so you don’t feel a thing. They also inject anti-coagulant and then enjoy the flow of their food source, YOU! Some are sensitive to this injected substance. Some are not. You will know which one you are because the site will become red, raised, perhaps itchy. This allergic reaction may take a few days to appear and you will most likely blame an innocent mosquito. It may take days to realize the pests are not outdoors at all! Upon closer inspection of your symptoms, they will only be on exposed skin. You might notice a linear pattern to them. There may be more than one bite per bug. Many bites doesn’t mean that there were many bugs. Also, when they wish to eat, they remain persistent until they find a usable blood vessel. You itch! Now what? First of all, keep the area clean. Treat the affected area as you would mosquito bites with some calamine lotion. You can also make a baking soda paste to apply, or buy a hydrocortisone cream if it’s really itchy and swelling. Some find relief in using some aloe vera gel or lotion. The important thing is that too much scratching could open the wound and become infected. Children and the elderly with a weaker immune system are more susceptible to this occurring. Should you suspect bedbugs are the source of your bites, do a thorough search starting with the bed. That’s where their name came from! Check anything with a seam. This means the mattress first and foremost! Look for peppered stains, flecks of dried skin, spots of blood. You might even find a live one, a reddish-brown, apple seed size. Continue your investigation on any bedding including your pillow. Check out the box spring very closely as it has numerous hiding spots inside and out. You viewing should also include anything within a few feet of your bed. Should you find any signs of some existence the very best thing to do is call a professional bed bug exterminator. They can be a challenging problem to solve. A professional bed bug exterminator is your best bet in getting rid of bed bugs in your home or business. Hi-Tech Pest Control Services has been successfully eradicating bed bugs and all types of pests for over 30 years. 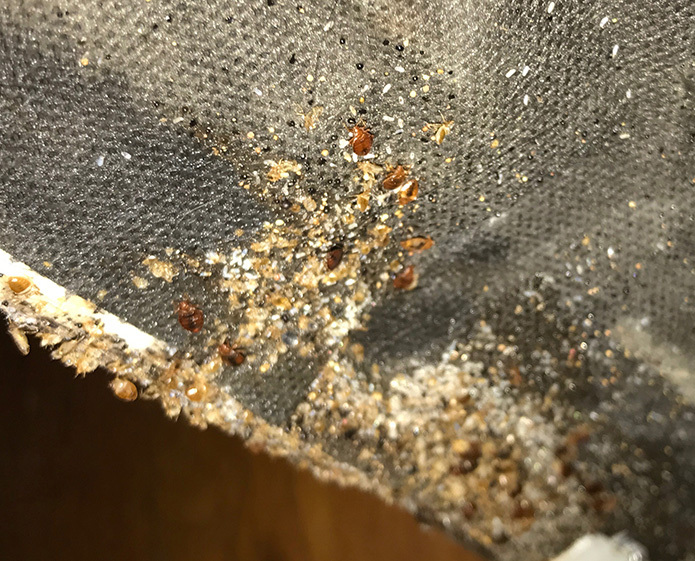 Bed bug infestations have become an increasingly large problem in Southeastern Michigan, due to an increase in travel and bed bug’s resistance to over the counter pesticides. Hi-Tech Pest Control uses the latest in technology and science to ensure your bed bug or pest infestation is gone for good. We offer a 6-month warranty on all bed bug extermination services. Call today for a Free Pest Inspection!